Vizio's entry level lineup of LED TVs has seen a pretty hefty upgrade for 2014, but the price is still one of the standout features. The most interesting feature on the E280i-B1 is the full-array LED backligting system that brigns enhanced contrast and screen uniformity uniformity. The smaller sizes of the E series do not feature Active LED zones for local dimming. Vizio Internet Apps Plus is also included in the E series for the first time. The internet enabled E280i-B1 is priced in the mid $200 range with a diffence in price for the non internet enabled version. The E280i-B1 has a great picture after calibration, but it doesn't render the picture depth of a plasma display. What's important here is the picture quality and screen size for the price. It's one of the best deals around right now for the size. Dark scenes can look a bit flat and blacks can seem to have a film over them interfering with overall immersion. The colors are not what I would call rich either. 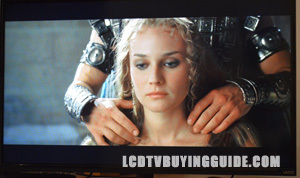 The Vizio E280i-B1 uses a full-array LED backlighting system to create the picture on this display. The full-array LED backlighting achieves much better peak whites and deeper blacks than seen on previous versions of the E series. Colors are also going to benefit from this backlighting scheme, as there will be less washout and uniformity issues. You only get 720p resolution and a 60Hz refresh rate. These are not going to be issues for size of the screen and would needlessly inflate the cost. An ambient light sensor is also included with this TV for adjusting the picture in response to the in-room light. The Vizio E280i has the Vizio Internet Apps Plus platform included. The built-in wifi allows for instant access and plenty of speed for HD content streaming. The 'Plus' in the name means the interface is much more user friendly and the overall performance is faster than before. Some of the most useful apps included are Netflix, Amazon Instant Video, VUDU, MGO, Hulu Plus, YouTube, Pandora, iHeartRadio, and Facebook. There are plenty more too. The E280i-B1 has also recieved some upgrades to the appearance. The bezels are now slimmer than they were last year, at a mere 12mm thin. Not bad for an entry level set. The profile isn't as thin as the larger models in the E series this year. The triangular stand protrudes from the back of the display so it isn't seen from the front. 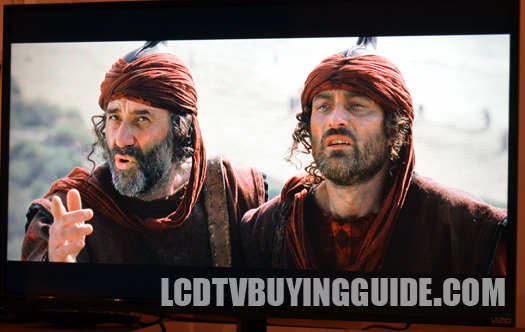 All in all, this is an average looking value LED TV. 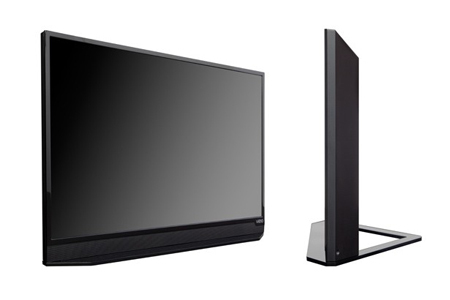 The Vizio E280i-B1 presents a decent value for the size. It more than likely this TV will be purchase over the similarly price 32-inch due to size constrains. The value rating came down since it is so closely priced to the 32-inch size. Picture quality for the price tag is strong. Strong contrast and picture depth from front and center is the highlight in the picture quality realm. Vizio Internet Apps Plus don't do anything new for the platform, but everything works well and doesn't leave much to be desired. Some downsides are a non-backlit remote, 2-point white balance, and a non-swivel stand. But these are dealbreakers by any means.